Sugar Ray Robinson, the ex-welterweight king, entered the ring with an amazing 120-1-2 record, his adversary, one he had grown accustomed to going to war with, climbed through the ropes with a 78-14-3 ledger. And the feared “Bronx Bull,” Jake La Motta was not going to give up his cherished middleweight crown without a fearsome, brutal fight. The two met on this day exactly 65 years ago and on this particular St. Valentine’s Day, the two warriors were interested only in exchanging hurt and pain – not flowers or gifts. The two may have had a begrudging respect for one another, but Sugar Ray and Jake, two completely different personalities and fighters, would go to any extreme, pay any price, to get the win in this, their sixth and as it turned out, last bout together. Robinson had won fight-one, back in October of 1942, by ten-round decision, but he had to get up from a knockdown to get the victory. LaMotta gained revenge in the sequel, some four months later. Again knocking Robinson down – or through the ropes to be more exact – Jake this time poured it on in the remaining rounds and won a big ten-round decision of his own. Never before had Robinson been hit and hurt so much. Astonishingly, considering the brutal nature of the fight, the third fight took place just three weeks later! This time, Robinson’s skill and speed edged the encounter, although once again The Sugar Man hit the deck and was badly dazed by the ferocious strength and power of the fighter born Giacobbe LaMotta. A fourth fight, yet another ten-rounder, was held in February of 1945, with Robinson winning via unanimous decision. By this time, the two great fighters knew each other well, perhaps too well, each man knowing the hard and dangerous fight the other would bring. “I fought Ray Robinson so many times, it’s a wonder I don’t have sugar diabetes,” LaMotta would say years and years later when safely ensconced in retirement. The fifth encounter, a 12-rounder, took place that September and controversy ruled as “Robbie” scraped by with a debatable split verdict. Jake cried robbery and many fans agreed with him. 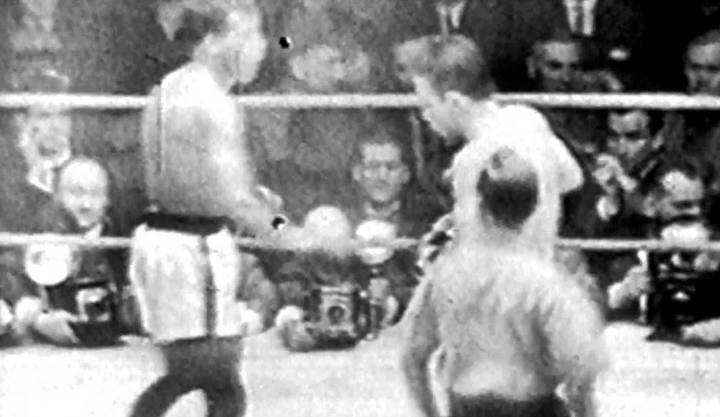 Robinson later stated how this fifth fight was the toughest he had had with LaMotta. But an even tougher fight with his archrival still awaited him. Officially, Robinson was 4-1 over Jake at the time of their sixth and final match. This one, contesting the middleweight championship of the world, became legendary almost as soon as the dust had settled in The Chicago Stadium. LaMotta, who was notorious for gaining huge amounts of weight between fights, was somewhat depleted by the effort of making the middleweight limit for this, the only world title fight between he and Sugar Ray. The earlier rounds saw LaMotta’s bullish strength have some success, but Robinson, though out-weighed by a considerable margin (officially 155.5-pounds to Jake’s 160) was much the faster, swifter, classier fighter; his greatness really taking over by the 8th. By this stage of the battle, LaMotta was taking a beating – so much so that the fight was given its famous tagline. LaMotta, possessing one of the most scarily hard heads in all of boxing’s long history, refused to yield. He was on the verge of real exhaustion by the 12th-round, yet his inner demons forced him on. The pounding he took in the 13th shocked even hardened boxing observers. The ring and its canvas now crimson, LaMotta had been reduced to immobile punching bag by Robinson’s relentless uppercuts and hooks upstairs combined with his wicked shots to the body. Robinson really did nail LaMotta with every punch in his educated arsenal. Eventually stuck on the ropes, his head being savagely slammed in all directions, LaMotta, barely conscious, somehow, had the later satisfaction of not going down. Robinson, who had almost punched himself into exhaustion, could barely celebrate, but he had scored the ultimate win over his most testing rival. Now the middleweight king, Robinson was a true immortal. So too was LaMotta, who, today as a 94-year-old, has long outlived his former ring enemy. The incredible final fight between these two legends of the highest order today celebrates its 65th birthday. The least you can do is watch the fight unfold on You Tube and raise a glass to both combatants.